I have been surrounded by art all of my life. My father is a potter and sculptor and my mother was an avid if not obsessive gardener and writer. Both have been important creative influences and have taught me about the passion of expression in one’s art, work, and life. 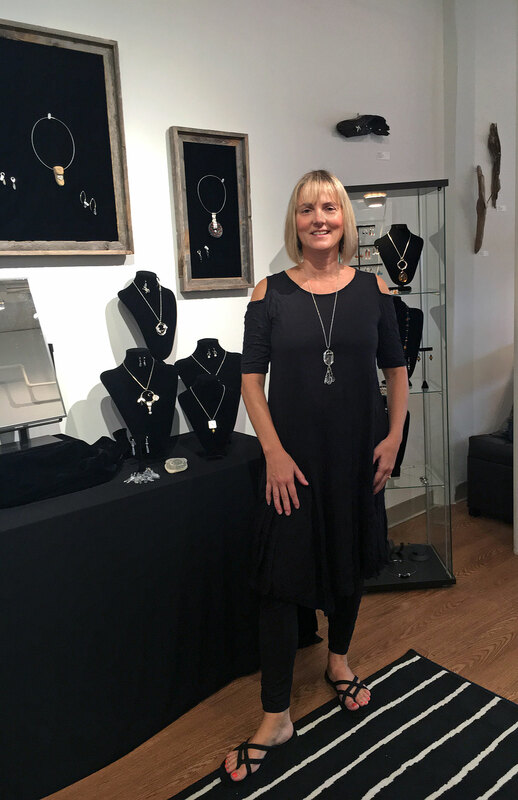 The jewelry and sculpture I create are a reflection of what is happening in my life just as it was for both of my parents. I am continually experimenting and combining precious gems, pearls and metals with found objects. For the last 25 years, I have cultivated the traditional metal working skills I gained in art school, but I also enjoy breaking the rules by melting, fusing, piercing and burning materials to bring out their natural beauty. That combination of traditional and creative—of left brain and right brain—is how I see the world around me, so it is not surprising that it appears consistently in my work. My work is largely about transformations—about taking diverse materials and creating something new and different. The driftwood I frequently use, for example, was once a tree, vibrant with life and growing. It goes through a metamorphosis at the end of its life, falls into the sea, and finds its way to the shore. By resurrecting it in my sculptures and wearable art, I create a new phase in its life. It is reborn. I received my BFA in metals at the School of American Crafts at the Rochester Institute of Technology in 1991 and currently live in Connecticut with my husband and two daughters.